Tim is a wonderful loving husband and father of 3 young children. Nine weeks ago, Tim was diagnosed with Usual Interstitial Pneumonia (UIP), an incurable and untreatable lung disease characterized by progressive scaring of both lungs. Five weeks after being diagnosed, Tim was admitted to the hospital with a massive flare up of the disease and was told that he would not be leaving the hospital until he received a lung transplant. Nine days later, on February 18th, Tim was blessed with his transplant. If it had not been for the love of a donor, Tim truly would not be here with us today. His condition was critical and he was on life support with the possibility of only one more week to hang on. We cannot thank than the donorâ€™s family enough for this amazing gift to Tim and our whole family. Since the transplant, it has been a rough road to recovery; Tim had blood clotting issues, needed temporary dialysis and additional surgeries, and had scares with blood pressure. Tim is finally stable and doing very well. Having been bed ridden for a month, his muscles are weak and he is pretty frail, but he is working hard with physical therapy has a very positive outlook on his recovery. Tim is self-employed and the sole provider for his family. As you can imagine, this is an extreme burden on our family. Even with insurance, there are many out-of-pocket transplant related expenses, not the least of which is the very costly medications he will need to take for the rest of his life. 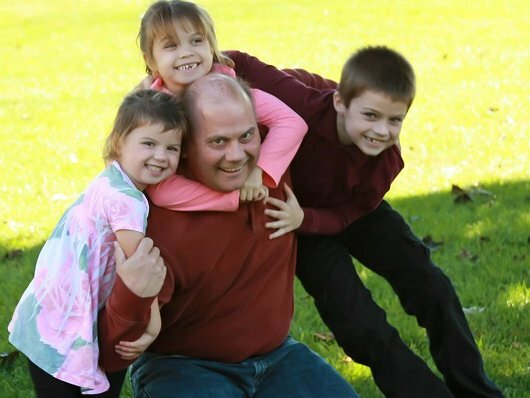 To help with this financial burden, a fundraising campaign in Timâ€™s honor has been established with HelpHOPELive, a nonprofit organization that has been assisting the transplant community for 30 years. All donations are tax-deductible, are held by HelpHOPELive in the North-Central Lung Transplant Fund, and are administered by HelpHOPELive for transplant-related expenses only. Your contribution is greatly appreciated. We are very thankful for the generous people who are helping Tim and his family with these unimaginable costs. Thank you all for helping and caring so much about our fun loving Tim! Tim will be going to the in house rehab floor later this week. He is doing really well! Kidneys and liver looks much better now. It seems like about once a week he needs a blood transfusion but again they say that is not out of the norm after this surgery. He is very anxious to get home! And he has asked the lung transplant coordinator when can he return to work? Which she responded lets focus on getting you through recovery first! There have been several bumps in the road but now it has been looking pretty smooth. Thanks to all of you for keeping Tim in your thoughts and prayers. Tim got transferred at 2:00 am this morning to his new room on the floor. He is having some minor surgery tomorrow am at 7:30 for a very large hematoma (spelling?) on his right upper chest. Apparently the small drain they removed 3 days ago must have been clotted and they thought there was no more drainage in there and the blood is now pooled there. It looks terrible. He has so many bruises all over his body. So also because of that they had to give him more blood today. He is pretty pale and very tired so there was no PT today. He should be there on average 2 to 3 weeks still. The room is: 4SW (South West) room #23. I would say to wait a couple more days until you would like to visit. He is just so drained right now. He really needs a lot of sleep. He did not need anymore dialysis today because his “numbers look really good”. So kidneys are getting better. His stomach still needs to wake up. It s hard for him to eat because he feels full all of the time even when he hasn’t eaten anything. Hopefully tomorrow will be a better day for him after the surgery. Thanks again to all! Tim is doing great! He is still in ISCU but should be on the “floor” Friday or Monday. He may only need 1 more dialysis session scheduled for tomorrow. All chest tubes are out and that went very well. PT is working hard with him to get him back on his feet. He does have 3 blood clots that they have found, but he is on a Heprin drip to keep the clotting from worsening. May take 3 months for the clots to be reabsorbed into the body. But he is on the road to recovery! Thanks to all of you for your continued support!! Tim says “HI”! Tim is doing better every day. He should be off of dialysis today and getting his chest tubes removed. MAYBE even get the ventilator out! He is getting very frustrated with his progress. He thinks it is too slow. We keep assuring him that all is well and it takes a bit of time to recover from such a major surgery. Thanks for all of your support and prayers! Without all of you, this would have been even much harder to go through. So happy - sounds like things are really going well and you will all be under the same roof again soon!!! Kim you are doing an amazing job from the sounds of things - you just keep your chin up and your cape on!! And Tim, you keep on healing!! Thank you Jesus!! :) Take care!! Many toughts and prayers have gone out to you from Ball FTA. Hope to see you back here soon. In case others wish to, I also wanted to note I used the Ball Community Ambassadors site ball.benevity.org to make my donation and take advantage of the company match to benefit Tim. Glad to hear you have been moved to a "regular" room. :-) It sounds like your recovery is headed in the right direction. Take care Tim, and our thoughts are with you and your family. Get well soon Tim! Hope to see you back to work quickly as well! Our prayers go out to you and your family! Get well soon - see you back at work, Dale. Get well fast Tim, our thoughts are with you and your family. Tim I hope you are soon up and about. My prayers are with you and your family. We miss you here at the Fort plant. Get well and hope to see you back at Fort soon! Miss you around here! Get better soon!